I myself were a wheel. 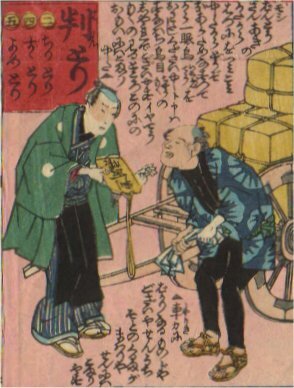 Gissha (ox-drawn carriage), Daihachi-guruma (two wheel wagon) and Ten-bin-bo (yoke) were used to carry the goods. The government limited the use of carriages strictly from the military point of view, even Gissha and Daihachi-guruma were registered officially. Han-tori means the invoice which proves the delivery.